There aren't many more welcoming sights than a fellow boater inviting one to tie-up to his boat. Yeah, but ain't you a wee bit worried that he is wearing breeches? No. 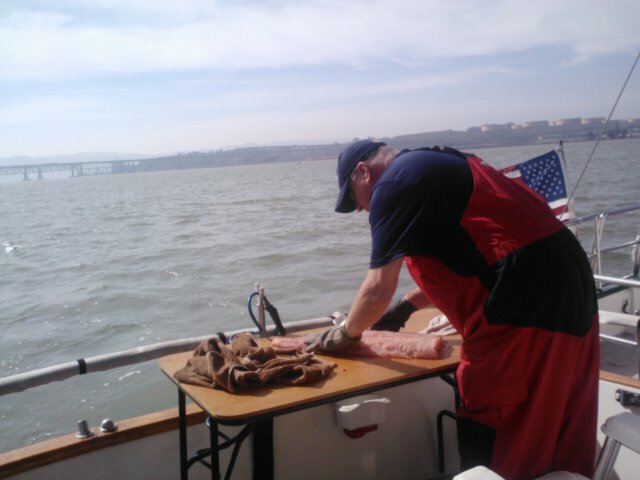 He was filleting sturgeon. So a man in breeches holding a fillet knife... and you tied alongside? Did you ever see the movie Deliverance? I trust my life with that knife holder. Breeches? I think Al is sporting a "Jonesport Tuxedo"
Breeches? We don't need no stinking breeches!